Bioinformatics /ˌbaɪ.oʊˌɪnfərˈmætɪks/ (About this sound listen) is an interdisciplinary field that develops methods and software tools for understanding biological data. As an interdisciplinary field of science, bioinformatics combines computer science, statistics, mathematics, and engineering to analyze and interpret biological data. Bioinformatics has been used for in silico analyses of biological queries using mathematical and statistical techniques. 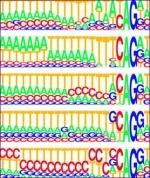 Bioinformatics is both an umbrella term for the body of biological studies that use computer programming as part of their methodology, as well as a reference to specific analysis "pipelines" that are repeatedly used, particularly in the field of genomics. Common uses of bioinformatics include the identification of candidate genes and single nucleotide polymorphisms (SNPs). Often, such identification is made with the aim of better understanding the genetic basis of disease, unique adaptations, desirable properties (esp. in agricultural species), or differences between populations. In a less formal way, bioinformatics also tries to understand the organisational principles within nucleic acid and protein sequences, called proteomics.